Mr. K and I recently vacationed in the Florida Keys, a stunning resort area surrounded by brilliant turquoise blue waters and wafted by warm gulf breezes. 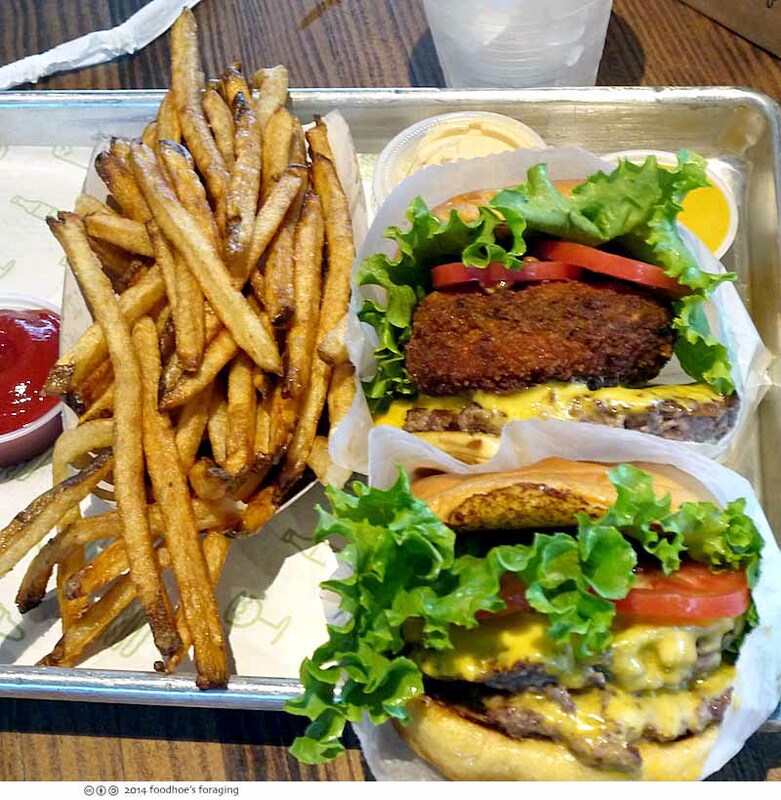 In the spirit of vacation, I abstained from controlling our eating agenda, with a single exception when I noted that the celebrated and much ballyhooed Shake Shack had a location in Coral Gables which was conveniently on the way back to the airport. And so we had to stop there. 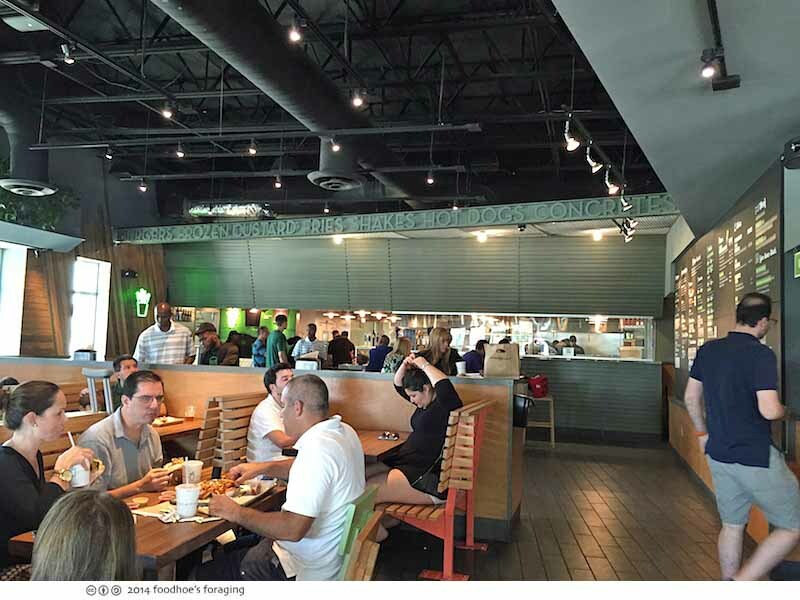 Shake Shack is a chain with 31 locations in the states, 24 overseas locations in the Middle East, Turkey, Russia and the UK, and none out our way, although they plan to expand in the mid-Atlantic, Chicago and Las Vegas is as far west as they get for now. Americans, nay the world loves a good burger and this place is really making an effort to be known on a global scale. I know you’re thinking, yo foodhoe! How lame to cross the country and set your sights so low… But this is the Shake Shack my friends! People have been raving about this place for years and I heard reports that waits of an hour and a half were standard practice, so we felt like we won the jackpot when we found no such lines and easy seating. The restaurant is green in color and because it is constructed with recycled and sustainable materials, featuring tabletops sourced from reclaimed bowling alley lanes handcrafted in Brooklyn, NY, as well as window seating with wooden counters made from river-recovered cypress. They aim to please with free Wi-Fi and there’s a ping pong table for interested parties. 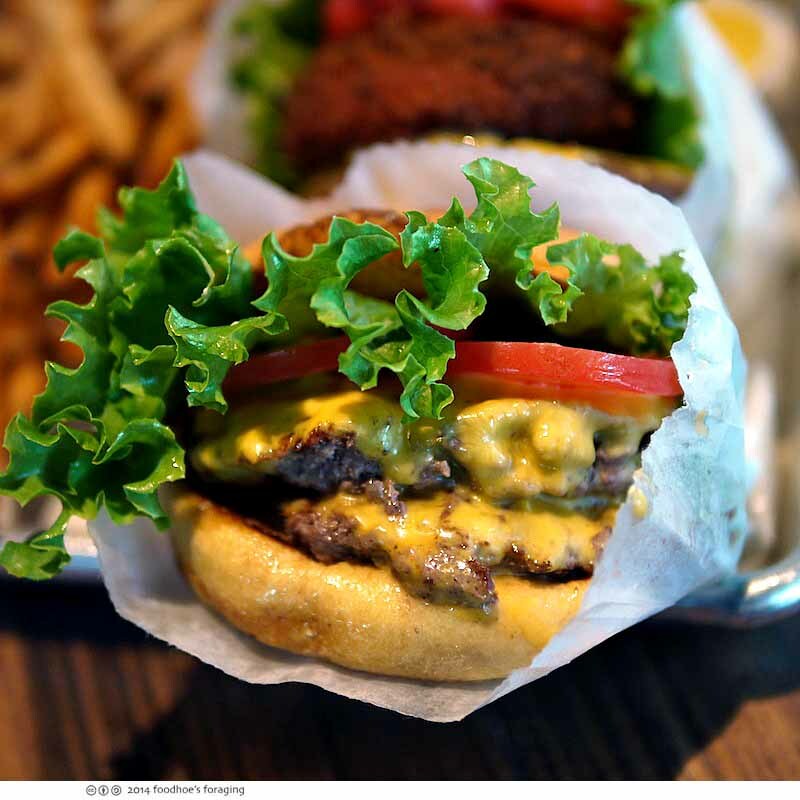 It’s hard not to have heard about the Shack, which is on the radar of hamburger aficionados everywhere, having been discussed on Nightline by Josh Ozersky, a true burger and meatophile and at Esquire Magazine’s State of the Hamburger panel in 2011. In the early years, all burgers were made from a special blend created by master meat purveyor Pat LaFrieda who has a show called Meat Men on the Food Network. When the chain expanded to Florida, the team found a small local Miami purveyor called Bush Brothers, who use the same cuts, the same process, the same overnight fresh shipment of buns and other ingredients. 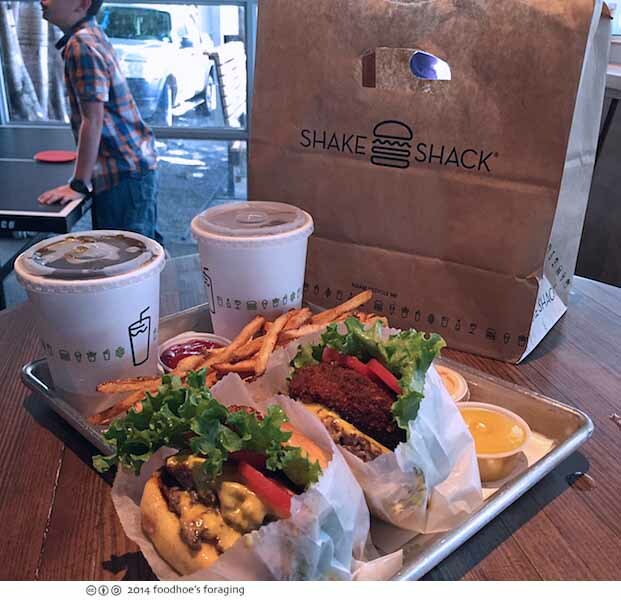 The menu offers a variety of burgers, hot dogs, fries, shakes and frozen custards, concretes which are dense frozen custard ice cream blended at high speed with mix-ins, beverages including beer and wine and even a couple of treats for your dog. I couldn’t resist the Shack Stack® ($9.15), which is a cheeseburger topped with a ’shroom burger garnished with lettuce, tomato and ShackSauce. The ‘shroom burger is a battered and fried portobello mushroom filled with melted muenster and cheddar cheeses that exploded with umami flavors. 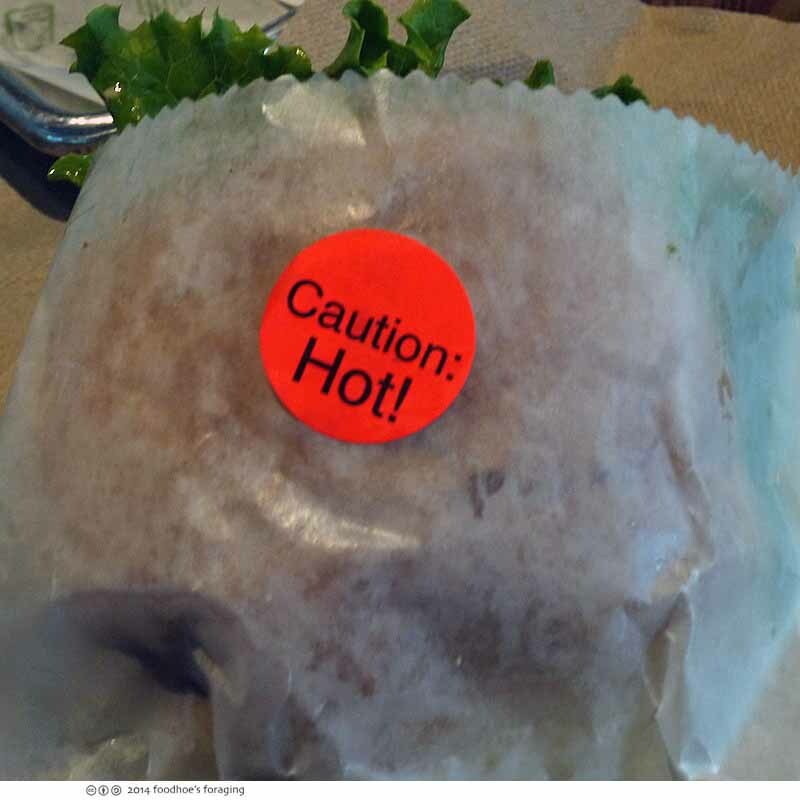 This particular burger comes with a bright orange sticker cautioning it’s Hot! so you are warned to be careful when you bite into the ‘shroom burger which is filled with molten cheese and juicy mushroom essence – it is hot, hot, hot! 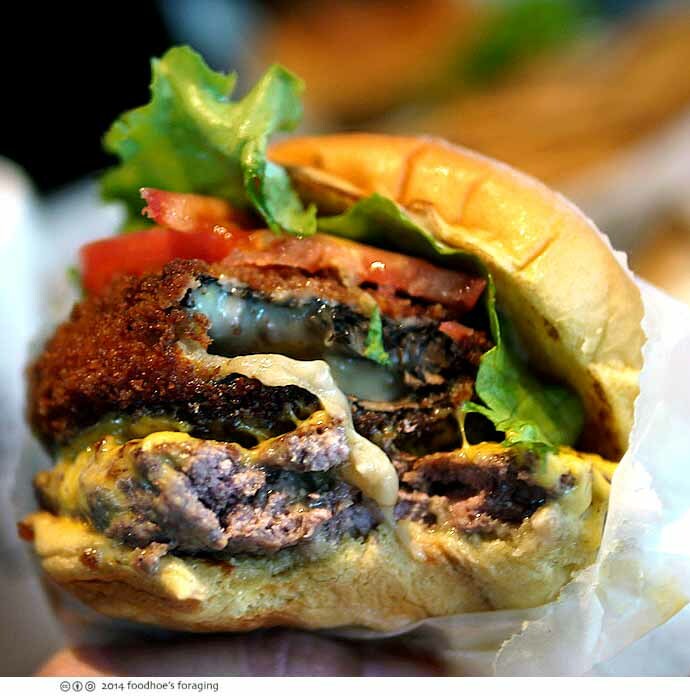 I just loved the ‘shroom burger combined with the flavors of that luscious meaty cheeseburger…. it was a a heady balance, each element complementing the others. We ate in reverential silence. We split the Hand cut Fries ($2.90), which are made from fresh skin on Idaho russet potatoes and cooked twice. These replaced the original crinkle cut fries, and were very good, although not airy fairy like McD’s. 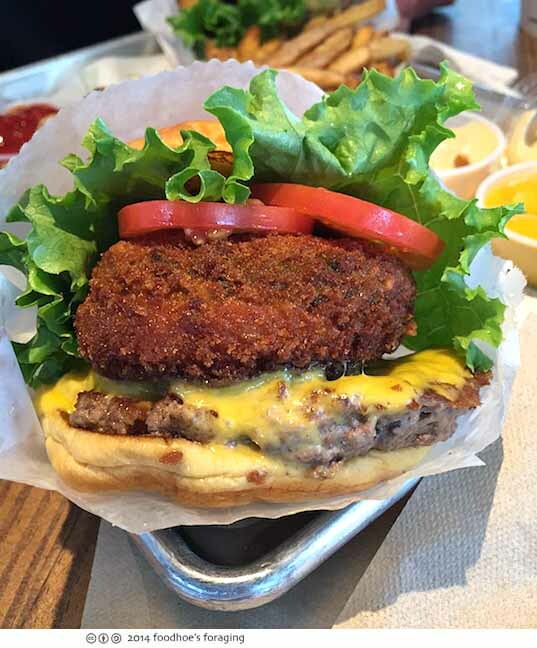 We agreed that this was a notch above any other fast-food burger we’ve had so far. Unfortunately, I’m a bit lactose intolerant and didn’t want to get involved with shakes/concretes right before getting stuck on a plane for the next four hours… so that part of the menu remains unexplored here. 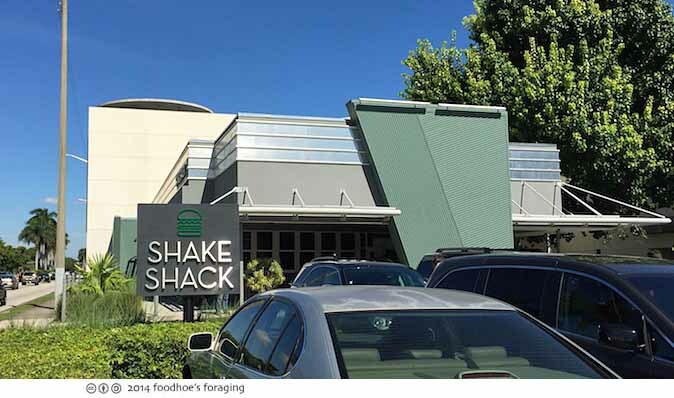 Shack Shack, when are you going to open a shack out on the west coast? The world wants to know! Great looking burgers! They look very tempting. oh my. i’m suddenly glad there aren’t any of these around me–i’d be as big as a house! I am waiting for that day so I can be first in line!